Just announced! We are so excited to be offering this workshop. 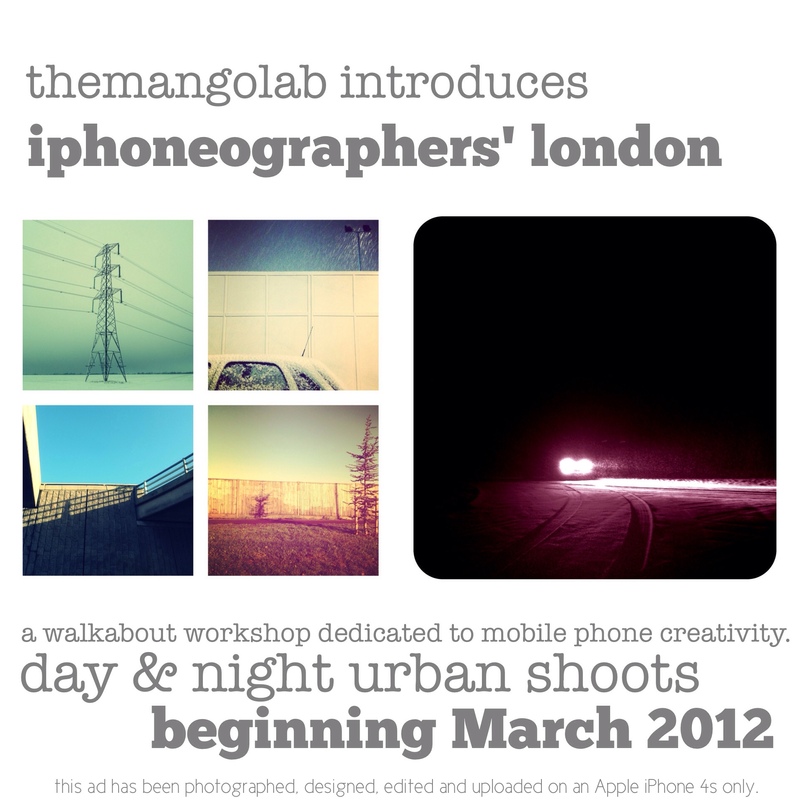 Join us for our inaugural run of the iphoneographers’ london workshop coming up Sunday March 25th 2012, 11:00 am. Mobile phone photography tends for many people to be just a quick capture. A document, a record, maybe a fun snapshot where a camera would have been good to have but the camera phone was the next best thing. As technology advances there is a revolution of photography that is taking place – an art form and creative appreciation for this compact device. From apps to photo specific social networks people are jumping on board using the camera phone not only as a recording device but as a creative tool. In our iphoneographers’ london workshop you will learn to use the mobile phone to see and photograph in new and creative ways. This brief lead afternoon will mix team competitions and individual challenges that will raise the bar in both creative pursuit and social media adventure. Using the flexible and uncomplicated nature of the camera phone technology, the art of the snapshot and a bit of opportunity in the making we will produce an afternoon of images that will look exciting. In addition to visual exercises and briefs you will learn about app tricks and methods, the inclusion of font, and post process wash and ring techniques as you work to produce unique looks to your imagery. Course cost : £45.00 per person. Location: TBA but you can count on the exciting urban backdrop of London. Book your space now on 0203 002 4991 or call us for more information. To see a variety of work shot by Karl who will be leading the course go to @stuffcarlsees on www.instagram.com.